Every Saturday, I host a feature called Kid Konnection -- a regular weekend feature about anything related to children's books. This week, I'm going to share with you the first two books from a fun series for early middle grade readers. Summary: Kelsey Kline is the best reader in the third grade—well, maybe tied for best with know-it-all Simon Ellis. When the principal, Mr. Boone, announces a school-wide reading contest—complete with a pizza party for the winning class and a special certificate for the top readers in each grade—she knows she’s just the person to lead Mrs. Molina’s third graders to victory. But how can they win when her classmate Cody Harmon doesn’t want to read anything, and even Kelsey’s best friends Annika and Izzy don’t live up to her expectations? And could Simon possibly be reading all of those books that he claims he is, or is he lying to steal Kelsey’s rightful spot at the top? KELSEY GREEN, READING QUEEN and ANNIKA RIZ, MATH WHIZ by Claudia Mills and pictures by Rob Shepperson are the first two books in the Franklin School Friends series, and I thought they were adorable. I'm pretty sure that Booking Daughter would have enjoyed these books in second or third grade because of the cute stories as well as the wonderful illustrations. Each book in the Franklin School Friends series focuses on a different kid. I hesitate to say "girl" because I'm not sure if some of the future books will feature male characters. Based on the two books that I've read, there are three friends -- Kelsey, Annika, and and Izzy who are in third grade at Franklin School. I am assuming that the third book will star Izzy and I wouldn't be surprised to find that a future book stars Simon, the boy who is "good at everything." 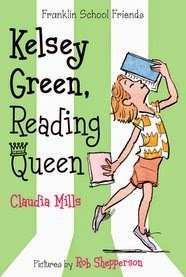 In KELSEY GREEN, READING QUEEN, Kelsey considers herself to be the best reader in third grade. So when the principal announces a school-wide reading contest with lots of fun prizes, Kelsey is determined to prove that she can read the most books. She doesn't think she'll have any problem winning the individual contest, and she wants to ensure that her third grade class wins the pizza party! However, Kelsey soon discovers that there are some impediments to winning. First of all, she can't just read anytime she wants (even during math class!) Secondly, Simon seems to be reading at an impossible pace. And lastly, some kids (including Annika and Izzy) don't seem to be taking the contest as seriously as Kelsey! 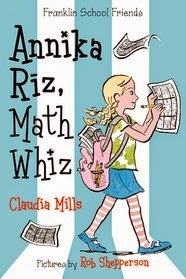 In ANNIKA RIZ, MATH WHIZ, Annika learns about a sudoku contest at the local library, and she's certain she can win it and prove once and for all that math is cool to her friends. The only thing in her way is Simon who just might be as good at sudoku as Annika. While waiting for the results from the contest, Annika is working at the school fair. After multiple attempts to make cookies, she and her friends decide to sell homemade lemonade. It's Annika's sharp math skills that allow her to realize that they are not charging enough for their drink. Ultimately, Annika's friends do see the importance of math in their every day lives! I thought KELSEY GREEN, READING QUEEN and ANNIKA RIZ, MATH WHIZ were both cute stories. I like that they focused on friendship and showed that every child has something that makes them special. I also appreciated how the girls treated each other -- I guess these girls are nice and too young to start the catty behavior that I've seen in so many other books recently. As a mom, I loved the lessons in these stories. There are so many things that you can discuss with your child including friendship, jealousy, hard work, the importance of education, and helping others. In addition, I think children will love the characters and humor in the stories. One thing that really stood out to me were the illustrations. They are absolutely gorgeous and so detailed! Besides bringing the stories to life, they are beneficial to readers who might be intimidated by the amount of words on each page. I remember my children liking when there were a few full page pictures in the book to break up the text. Another great feature of the books is that there is a teacher guide available for KELSEY GREEN, READING QUEEN and ANNIKA RIZ, MATH WHIZ. It has quite a few discussion question for each book as well as some challenging activity ideas including writing a poem about a character using fractions and showing how math is relevant in daily life. Educators will appreciate that there are references to the relevant Common Core Standards. There are also some cute printable bookmarks. I really enjoyed these two books and I suspect young kids will love them! Great for school and home libraries! Thanks to Blue Slip Media for providing review copies of this book. Giveaway alert: I have copies of the first two books in the Franklin School Friends series--KELSEY GREEN, READING QUEEN (paperback) and ANNIKA RIZ, MATH WHIZ (hardcover). To enter, just fill out the form below before July 4th at 11:59 p.m. EST. I will randomly select and notify the winner the following day. This contest is open to those of you with U.S. addresses only. Good luck! I bet my niece would have loved these books. I like the story lines and the lessons. Very fun. These books look delightful and fun - I love the engaging covers. I'll be reading these soon and I'm really looking forward to them. My daughter would love to read these. If we don't win them, I'll have to order them! Thanks so much for featuring me on your blog today and letting me connect with your lovely community of readers. :) Yes, there will be three more books in the series, one starring Izzy, one starring good-at-everything Simon (that's the one I'm writing right now), and one starring struggling student Cody (who despite his lagging academic performance is wonderful with his menagerie of pets. Thanks again for all you do to connect books and readers.